Costume Quest 2 is a family-friendly role-playing game from 2014. 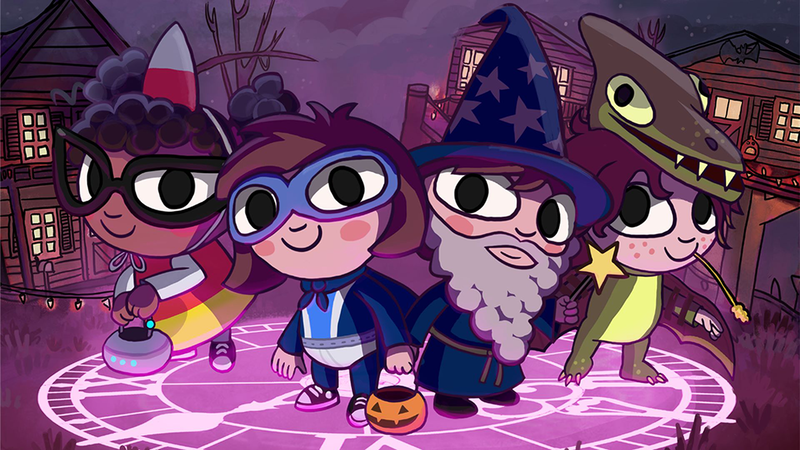 The game lets players become one of two twin siblings as they go trick-or-treating with their friends on Halloween night. Shenanigans quickly ensue, and players will be challenged to defeat the evil Dr. White, who wants to eliminate Halloween. The game allows players to do battle against a variety of enemies as they explore different environments collecting Halloween candy. During each battle, the game’s characters become real-life, oversized versions of the monsters, creatures, and characters they were dressed as for Halloween. In this spooktacular Halloween episode of Ready Player Mom, our own Amanda Farough embarks on her quest to save the most spooky of holidays before it’s too late. Costume Quest 2 is available to download for $14.99 on PlayStation 3, PlayStation 4, Xbox 360, Xbox One, PC, and Mac. The game is rated E10+ by the ESRB.